[ARCHIVED THREAD] - Which MAC-style 9mm do I want to look for? #1 It has to work. I don't want a brand/make/model known to have chronic issues. #2 Magazine availability. Nothing more frustrating than to own a gun that you cannot get mags for. #3 9x19mm. I am not really into .45. So what brand/make and model should I be looking for? Powder Springs MAC-10 in 9mm. I have a RPB/PS MAC-10/9mm and I love it. However, if you want the most versatile MAC, you want a M-11/nine. ETA: Thanks for not being me up on on my typo. I saw it when I came back to this thread. However, if you want the most versicle MAC, you want a M-11/nine. What mags do they use and are they readily available? 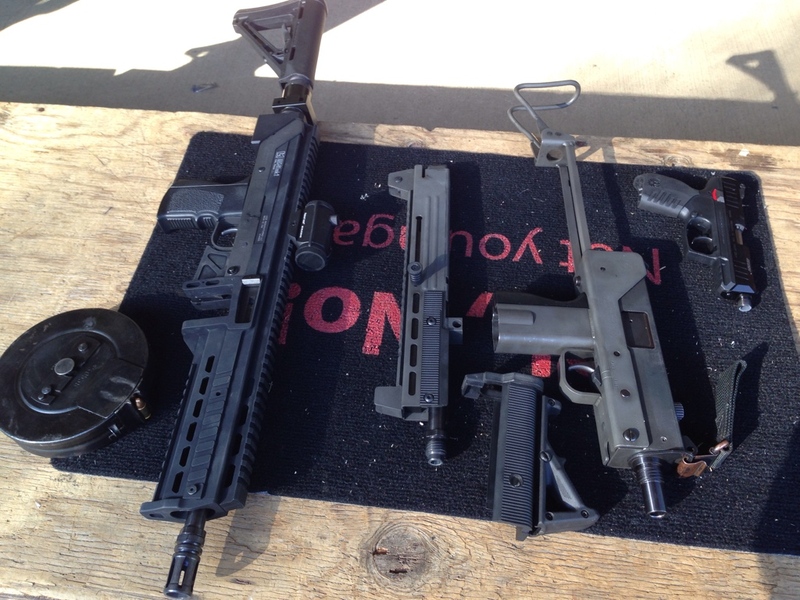 On the left is my SWD M11/nine sporting the MAX31 upper. The MAX11 upper is next to it. Not shown is the MAX11-22 kit that runs well in the MAX11 upper. There are several choices, but for new, reliable mags, Shockwave mags work well for me, WAY better than the super tight fitting zytel mags that came with the gun originally. If considering a M10 verses a M11/9, the mags are a toss-up. RPB makes new manufacture double stack 30 round magazines for the same price that Shockwave makes magazines for the M11/9. Upper receivers are the deciding factor. You cannot get a Lage M-31 upper for the M10. This allows you to use Suomi drums. There really isn't a good .22 LR conversion upper for the M10, although I do think that Practical Solutions and Lage are working on one, or have had limited runs of production. One thing is certain-- when the new products from Lage or Practical Solutions are first released, it will be for the M11/9 first, then offered for the M10 and MAYBE for the M11/.380 if they are successful. M11/9, more options on uppers. Currently you have the Max-31 and the Max-11. The Lage 22 kits are also a plus. The shockwave Z-Mags work really good. The Max31 takes Suomi drums. I can't afford to feed my 9mm subguns as much as I would like. To heck with a 45! I'm gonna throw this out there. Maybe it's out of place, but I have to say it. You may consider a BRP Stemple tube gun, like the U9 or 34k for the same price range. When I say price range I mean M11/9 plus all the Lage upgrades. At least from how I read the OP, I bought a RPB M10 that has the Uzi grip modification. Great mags including the Beta C drum (I just ought one). The mags are cheap, easy to find and easy to load. The Lage products aren't as easy to come by for the M10. But they have made the Mark 2. I primarily went with the MAC-10/9mm for the purpose of doing a Uzi grip modification (which you can't do on a M-11/9) and putting a Lage upper on it. Funds and a recent exploration of converting Suomi 36 round magazines has had me side-tracked. Thanks for all the responses! It has helped me edumacate myself and prompted me to do more homework before I spend NFA money on something. I want to pay the right amount for the right gun. Take your time, do the research and once you make the final decision - post pics and video. Enjoy yourself. Just to be clear, the Shockwave mags work in the Mac 10/9mm version? Reason I'm asking is because I have a M11/9 and the Shockwave mags run great in that so it would be nice to have a gun that uses the same mags. Also, is there a Lage upper for the M10/9? I do not know about the new SW mags, but yes Lage does make 10/9 uppers I have two. They run great. What value (I know, sorry for asking) would any of you put on an absolutely never been fired (since leaving the factory) in the original box with the original wrapping Powder Springs MAC-10 .45 made in 1973? The gun is in perfect condition with no rust and has just recently come out of its protective paper wrap for the first time in probably 40 years. The seller wants a bit of a premium for the condition. 5500ish? Not an expert, but thats my guess based on my research in the MACs recently. You want an M11/Nine as has been posted earlier. Shockwave make the new mags that work great. m11/9 with lage max 11mk2 or 31 with shockwave mags. They have 32 rounders as well as 50, or you can use Suomi drums with the 31. Check out Lage Mfg for all the goodies available then make your decision. M11/9 are going from 4500-5500 depending on model, accessories, etc. If it is new in box, you will probably need to do some tweaking to get it to run right, especially if it is a 86 gun. Check out subgubs, sturmgewehr, and the Mac section at uzitalk. Buy a used one that comes with as much extra stuff as you can get. While you wait for your stamp, get on the Lage list for a MAX-31 mk2 or a MAX-11 mk2. Worth every penny. But as other guys have said, if going the Mac route, lean towards the M11/9 for options. Are the SWD 9mm guns good to go? SWD is the only maker of the M11/Nine. Good to go and if anything is wrong, they can be readily repaired.